We’ve been out of town the past four nights, which of course meant eating out every meal. I know that might sound like a great break for some of you, but I’m a home body and I love cooking and eating at home. Especially when I’m dieting (W30)! We (my husband and I) had no problems sticking to our “eating” game plan while we were gone, but eating at home is so much simpler. 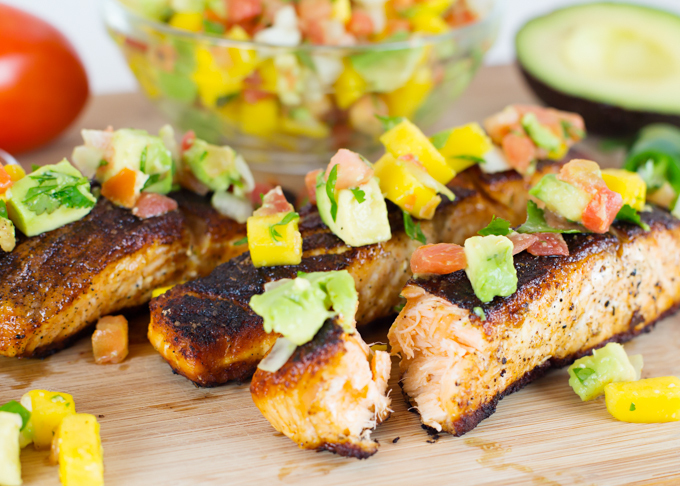 Our first meal home was this Blackened Salmon w/Avocado Mango Salsa. I served it with a baked sweet potato, and salad. It was DELICIOUS! The blackening seasoning added so much flavor. And the pico de gallo Avocado Mango Salsa with its sweet & spicy freshness was the perfect flavor compliment to the fish. I made up the quick and easy Avocado Mango Salsa late afternoon so the flavors could meld together. Then I mixed the seasoning blend and set it aside. When it was time for dinner, I seasoned the salmon filets liberally with the seasoning mix, then cooked them in a hot cast iron skillet. It was fast and easy, a surprisingly easy recipe for a fancy looking meal. Here’s the Mango Avocado Salsa recipe: I took a short cut and used a store bought fresh pico de gallo salsa (tomatoes, onion, jalepeno, and cilantro). I then diced one fresh ripe mango and one avocado. Both were small diced. I added 2-3 TBSP fresh chopped cilantro and fresh squeezed lime juice (1 lime). Mix all together and let set for at least an hour before serving. **Disclaimer, if you’re following any of my recipes that I note as Whole 30 compliant, please check your ingredient labels first as they can vary. I took a short cut and used a store bought fresh pico de gallo salsa (tomatoes, onion, jalepeno, and cilantro). I then diced one fresh ripe mango and one avocado. Both were small diced. 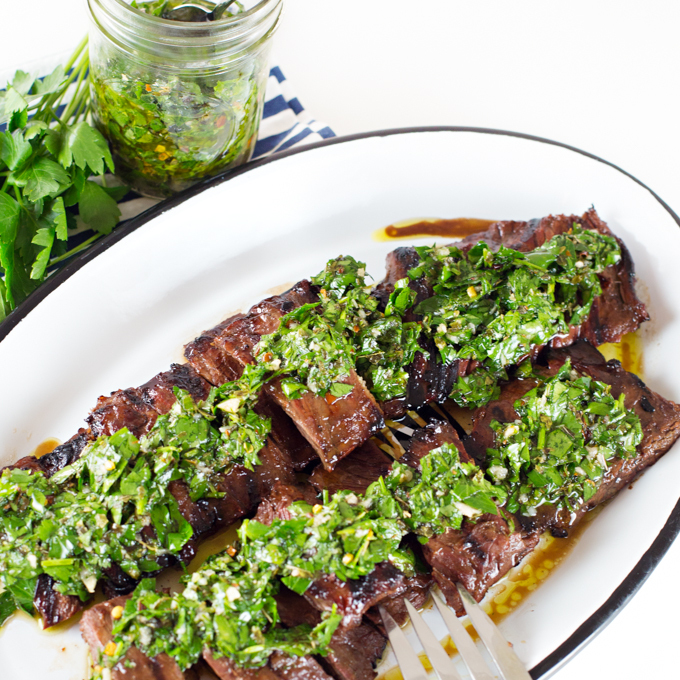 I added 2-3 TBSP fresh chopped cilantro and fresh squeezed lime juice (1 lime). Mix all together and let set for at least an hour before serving. Mix all spices (first 9 ingredients) together in small bowl. Liberally season both sides of salmon with spice mixture. Place into hot pan. Cook on first side 5 minutes, then flip and cook on second side for an additional 5 minutes. Depending on size of salmon filets, you may finish cooking for a few minutes stovetop, or place skillet into 350* oven and cook for another 5 minutes. Salmon is done when fish flakes easily with a fork. Average cook time is 10-15 minutes, depending on thickness. Mango Avocado Salsa: Combine together 1cup fresh pico de gallo salsa (homemade or store bought), with 1 fresh mango (small diced), 1 avocado (small diced), 2-3 TBSP chopped fresh cilantro, and juice of 1 fresh lime. Allow to set for about an hour prior to serving. 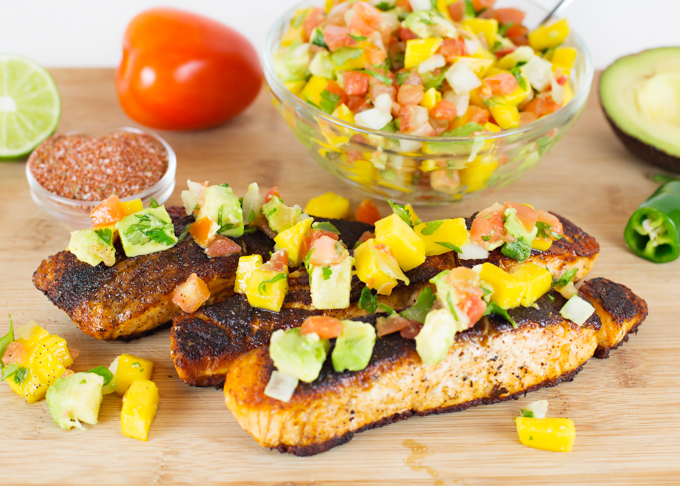 **To serve: top salmon with a heaping spoonful of Mango Avocado Salsa. Looks perfect for a Lenten meal! 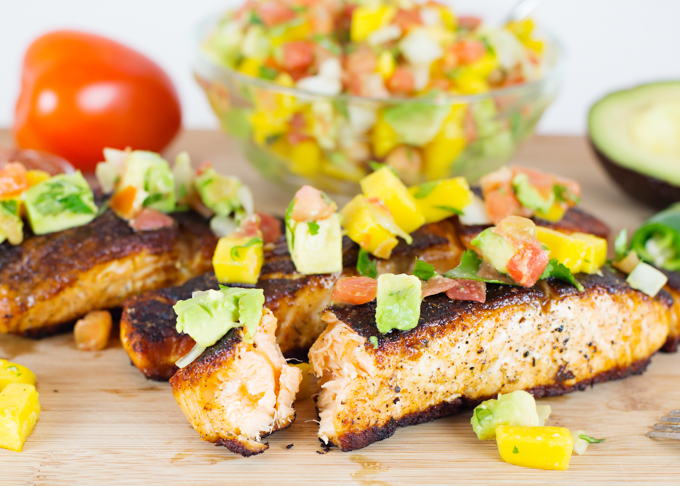 I love salmon—and your recipe and salsa look terrific! Marking this for our salmon season – sounds outstanding! 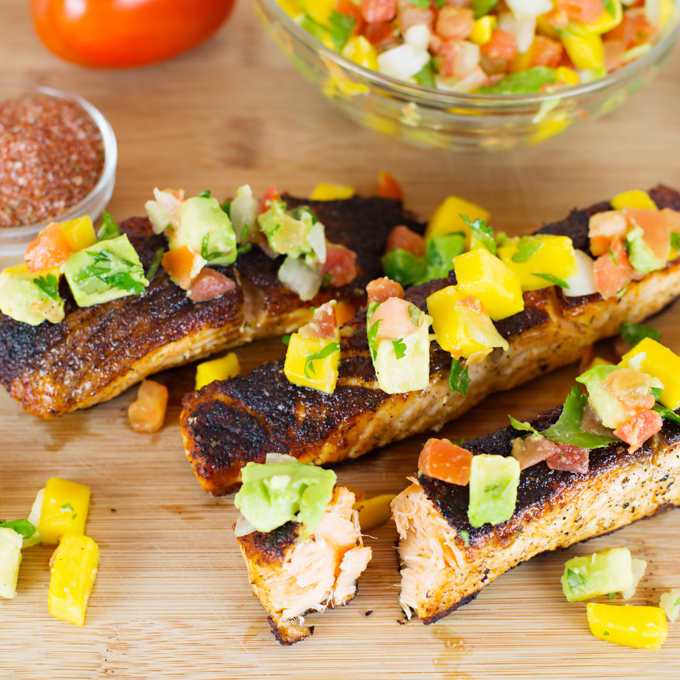 My boys love salmon – will try this out for sure! Let me know if you give it a try. The salsa is also delicious on chicken. This looks absolutely delicious! 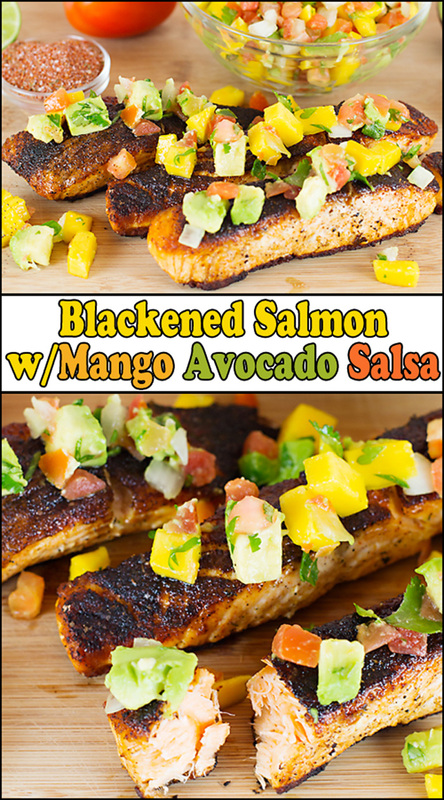 I love avocado and mango and I’m a newbie lover to salmon! Must try this soon! 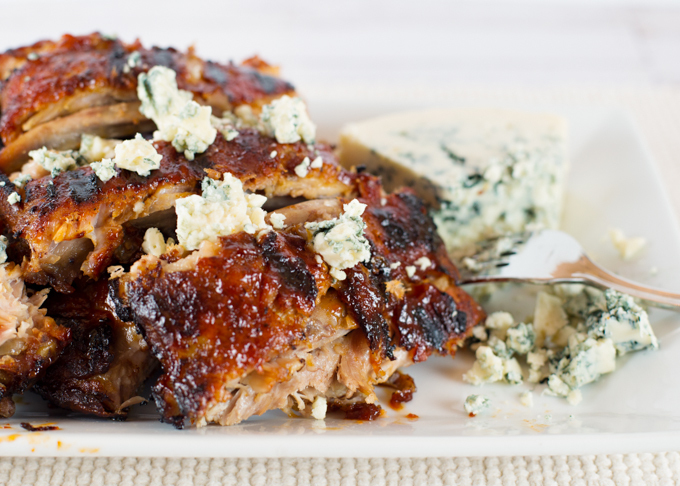 I love everything about this recipe. Looks wonderful! I’m kind of a homebody too =) this salmon looks soooooo good! We eat quite a bit of salmon so I am really looking forward to trying this. Oh my gosh this looks amazing. I’ve been craving salmon SO much lately, but since I’m pregnant, I haven’t been eating it! This will definitely be one of the first meals I make when the baby is born!! Marvelous recipe! 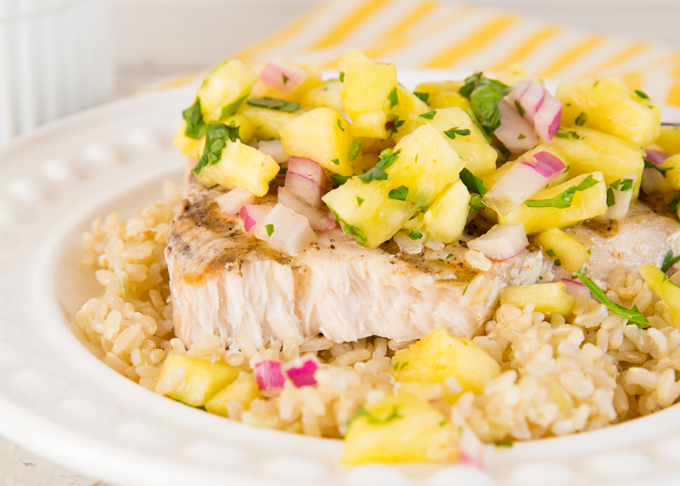 The blackened salmon with mango salsa is such a great combination! And so healthy too!